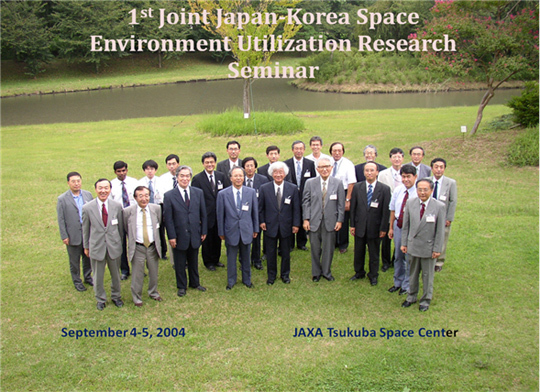 The first Korea-Japan joint seminar was held on Sep. 4, 2004 at JAXA Tsukuba Space Center. Here are the list of references for each seminar. Space environment utilization research is a relatively new science activity which makes use of space environment such as high vacuum, low gravity, space radiation, and wide field of view, for variety of scientific objectives. This is targeted to most of scientific disciplines on the ground such as physics, chemistry, life sciences, macromolecules, protein, materials, fluid physics, combustion etc.etc.. One of conditions in space, specifically microgravity, is the major benefactor to the researches because the reduction of gravity to zero uncovers the new phenomena which can not be observed under one-g condition on the ground. This micro-g provides a new dimension to the evolution of science and technology as a whole. United States, Canada and European countries have developed the space environment utilization researches since early 1980s by the Space Shuttle flights. Japan also joined the Space Shuttle utilization in 1990s, and carried out space experiments, facilitating the short term capabilities such as sounding rockets, airplanes and drop tubes. Now a number of nations; US, Canada, Europeans, Russia and Japan are carrying out the construction of International Space Station on Low Earth orbit. Thus, the advancement of space environment utilization sciences is highly anticipated these days. Governmental collaboration memorandum of science and technology between Japan and Korea was singed in 1985, and cooperation in basic sciences and technology development are supposed to have been pushed forward. The forum of the specialists: the third one, in Seoul 2001,yielded the recommendations on the guideline for furthering collaborations in policy, life science, nano-technology, information technology, oceanography and geo-science. The fourth forum was held last year in Tokyo. Yet, the topics on space environment utilization researches were not touched upon. Considering the circumstance as mentioned above, the joint seminar under the framework of JSPS bilateral channel by Japanese and Korean scientists on the relevant disciplines seems very timely, serving to the creation of new ideas and scopes on the future of sciences in space. Obviously the topics that had better be tried in space will be identified, the methodologies to carry the mission to space will be also examined and evaluated in the discussion. In addition, the insight to the betterment of ground researches will develop due to the new dimension of reduced gravity on the principles involved. The history of microgravity researches in Japan has more than 15 years. Korea has corps of world- class researchers in basic and application sciences who, to our understanding, are currently being organized into a group of specialists working for space environment utilization researches. The objectives of the seminar are; to establish the collaborative ties between the Japanese and Korean scientists in space environment utilization researches, to create the scheme handling technical problems for implementation, and work out the possible joint missions in space.